As I look to the start of the 2017 growing season and review farm internship applications, I can feel my excitement building. I imagine it’s a similar feeling that farmers get at the start of the season. Excited for what the year will bring, trying out new techniques, doing a little bit better than last year. Another season, another group of enthusiastic individuals looking to see if farming is a career path for them. Their backgrounds are as diverse as the tomato section of a seed catalog. Some are fresh out of high school, others looking to change careers. Some have zero farming experience and others have degrees in agriculture. There are big plans on how they are going to run a farm/restaurant/retreat center and others simply looking to get their hands dirty. For most, this season is going to bring a lot of surprises, a lot of reality checks, a lot of stories, and for a few, it will lay the foundation for their farming career. I am about to start my fourth season as a chapter coordinator with the Rogue Farm Corps, a beginning farmer training program in Oregon, and each year I am inspired by the folks that choose to uproot themselves to live and work on a farm for a growing season. Farming is not easy. As any of the interns will tell you, the first month they’re on farm, they are tired, like bed-time-at-8:00pm tired. Many experiences don’t require the strength and agility to squat, bend, and pull day in and day out. But as the months go by, they get stronger. One of my favorite image is of an intern, probably 5’2”, who at the start of the program could barely carry a 50 pound bag of poultry feed, but by the end she was easily carrying two 50lb bags as she zoomed around doing chores. What once seemed hard becomes routine. As their strength grows so does their knowledge about farming and their confidence in themselves. There are many steep learning curves when it comes to farming, and the diversity of tasks means that learning is happening all the time. How quickly can they weed a row, harvest those radishes, bunch those carrots? What are signs of pest pressure or over watering? How do you know when a watermelon is ripe? The training changes with the seasons, the weather, and the markets. So every day they are building upon the knowledge and experience of the day before. That’s not to say that there aren’t days that washing another radish or weeding another row seem terribly painful, but there is a tremendous amount of diversity in tasks and always room to improve. One of the greatest strengths and challenges of this program is that it is a full immersion program. Interns typically live and train on farm. As any farmer will tell you, it’s hard to pull yourself away from your farm. There’s always work to be done, and I think it is a service to interns to see the realities of farming. It is not a 9-5 job. While they aren’t the ones up at 11pm still doing tractor work, they see their farmer doing it; they see the commitment and dedication. Interns also get a crash course in communal living. If their communication skills weren’t great at the beginning of the season, they sure are improved at the end. Some of the biggest areas of growth I see in interns are their ability to advocate for themselves, to know what they need to be happy, and to learn to work through challenging circumstances. There are always going to be tough days no matter what you do, but knowing how to get through those days and persevere is a quality that will serve them well in whatever they choose to do next. This past week, as I chatted with a former RFC intern on the phone, I was reminded of the webs we create, the lives that we touch, and the importance of relationships. This was the first conversation I’d had with him since he graduated from the program 2 seasons ago, and I came to find out that he is still farming in Northern California and loving it. A couple weeks prior, I got a call from an intern from last season asking about greenhouses and starting seeds, because he and his wife are now taking over their family farm and putting down roots in Virginia. Another former intern is headed down to Southern California this week to meet up with a friend who did the program with her two years ago. Interns are still hanging out, keeping in touch, and supporting each other as they continue to build off of relationships they formed during their Rogue Farm Corps year together. 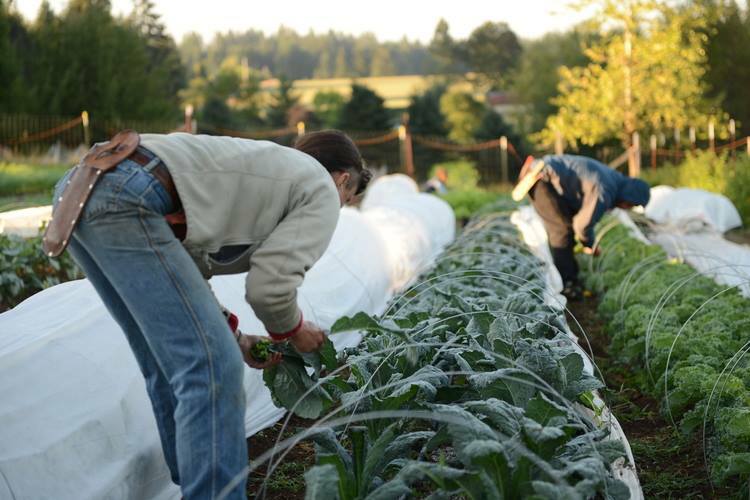 With each season we are growing the Rogue Farm Corps family, and growing the relationships that connect us to food, community and place. It is through this network that I see the future of farming thriving, and I am excited to add to the network with each passing season. There are still positions left with Rogue Farm Corps for the 2017 growing season. For details about our programs, host farms, and how to apply visit: www.roguefarmcorps.org.